I’m known by many names, but most recently, The Cookie Fairy, The Doughnut Fairy, and – this week – the Muffin Fairy are topping the list. I have a strange and, some might say, slightly deranged, habit of leaving phantom plates of baked goods on the tables outside of my neighbors’ doors, to be followed up with a sheepish text alerting them of the caloric fortune that awaits them in the hall. Hey, it’s my thing. Nearly as soon as these photos were taken, my neighbors were getting texts. I had to get these out of my house, or risk eating them all in the span of 10 minutes and promptly exploding. And that would just be messy. And gross. Ew, that’s a disturbing mental image. QUICK – DISTRACT ME. Oh yeah, muffins. Distraction accomplished. I wish I had a great story about what inspired these muffins, but the truth is that it was the least interesting inspiration ever. You ready for this? I was cleaning out the freezer. (Told ya.) It’s the first of many preparatory steps leading up to the currently-theoretical-but-hopefully-very-soon-to-be-imminent kitchen renovation. Wait, have I mentioned the kitchen debacle renovation plan? When we bought our condo 5 years ago, we knew it was a fixer-upper, but had no idea how long it would take to get all of the work done. We are finally ready to renovate the kitchen but ran into budget hurdles (i.e. we were given a quote than was twice our budget) but we’re getting the plans back on track now, I think, and I am trying to stay optimistic by continuing to plan and prepare as though this is going to happen, and happen soon. Which brings me back to cleaning out the freezer, which brings me back to a container of frozen rhubarb I found in the back of it. It wasn’t enough for a pie, but was too much for, say, scones or whatever, where the rhubarb is just a punctuation mark at the end of the bite, rather than the bite itself. 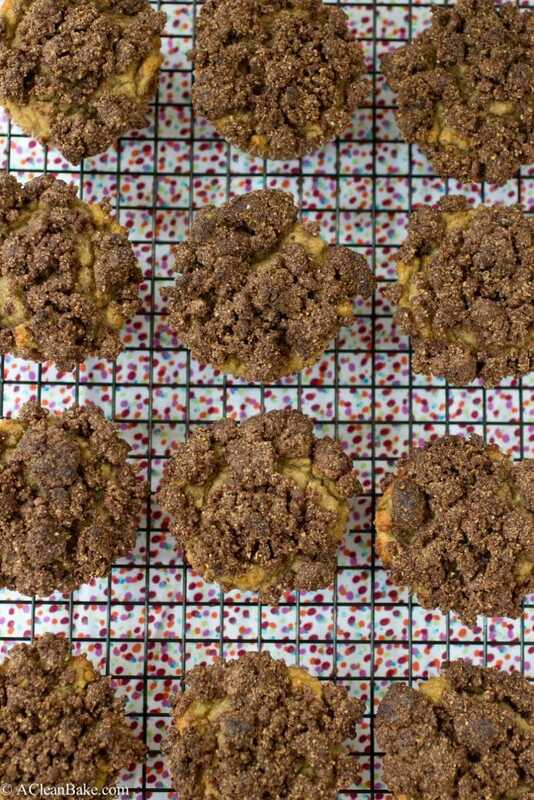 These muffins are packed with rhubarb, so you get several tender bursts of fruit in each bite. Rhubarb is a sour-bitter fruit (vegetable, I think, technically?) but when you cook it down, it looses its edge and responds really well to added sweetness and really, really well to a sweet, cinnamony streusel topping. 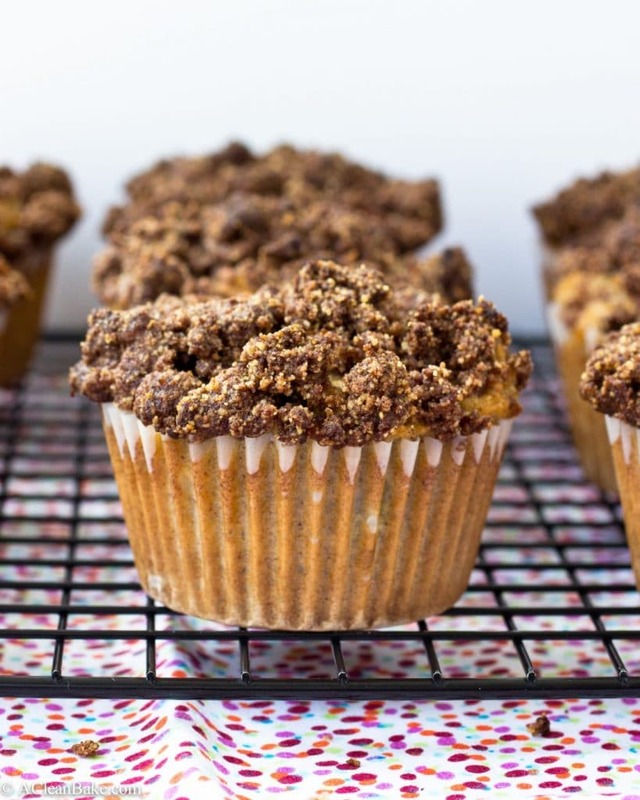 So, this may seem basic – an unassuming muffin flavored with cinnamon and vanilla, studded with borderline-castoff (or, depending how you look at it, super special, kept for a special occasion) fruit and dressed up with a simple streusel crumble – but it also might be everything you need for your breakfast this weekend. Preheat the oven to 350F. Line a 12-compartment muffin tin with cupcake papers and set aside. Prepare the muffins: In a large mixing bowl, whisk together the almond flour, coconut flour, tapioca flour, salt, baking soda, granulated sweetener, cinnamon, and cardamom. Then add rhubarb and toss to distribute throughout the dry mixture. In a separate bowl, whisk the eggs, then add the cooled butter/oil and vanilla extract. Whisk vigorously to combine. Pour the wet mixture into the dry and stir to thoroughly combine. 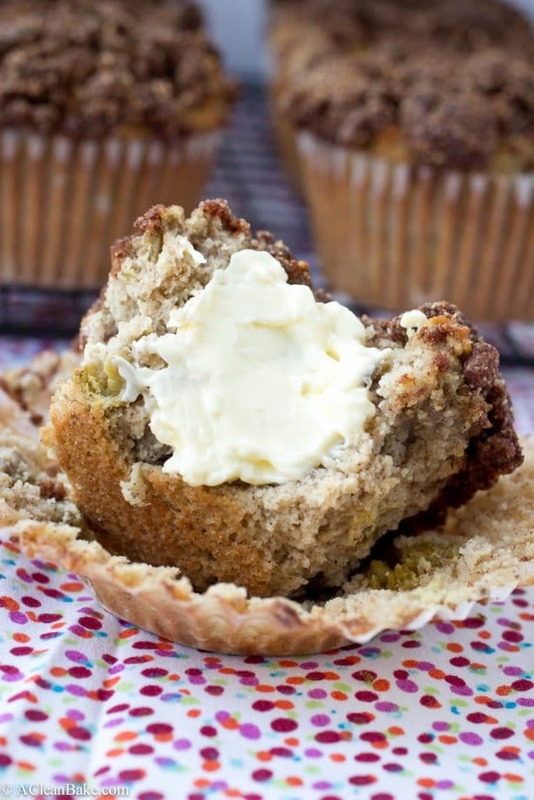 Divide the batter between the 12 prepared cupcake liners and set aside while you make the streusel. Make the streusel: In a large mixing bowl, whisk together the almond flour, salt, cinnamon, and granulated sweetener. In a small bowl, pour the warm coconut oil over the maple syrup and whisk to combine. Pour the wet mixture into the dry and stir until clumps form. Keep stirring until all of the dry mixture is incorporated. Use your fingertips to pinch the dough together to form large clusters. 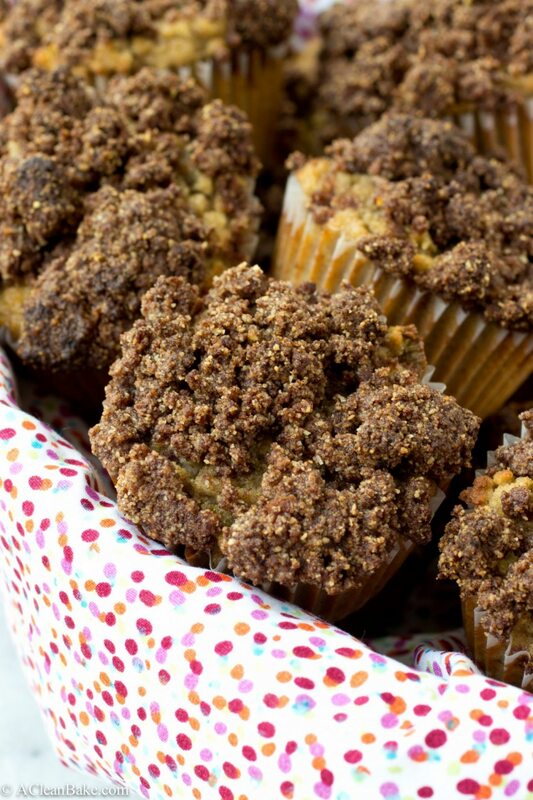 Divide the streusel between the 12 muffins, pressing gently into the batter to make sure the streusel sticks. Remove muffins from pan and cool on a baking rack before serving or storing. You can sub butter or ghee for the coconut oil, if you'd like. 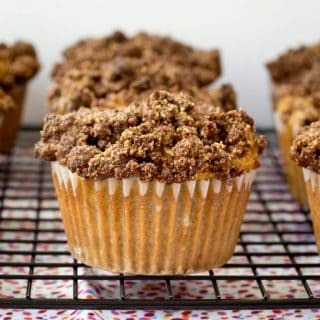 You can replace the monk fruit sweetener in this recipe with twice the amount of coconut sugar (3/4 cup for the muffins, 1/4 cup for the streusel). The room temperature eggs may seem like a trivial detail, but if they are straight from the fridge, their chill will solidify the fat, making it impossible to mix the wet and dry ingredients thoroughly. If you forget to take your eggs out of the fridge in advance, just submerge them in a bowl of warm water for about 10 minutes before you use them. Store cooled muffins in an airtight container at room temperature for up to 5 days, or in the freezer for up to 3 months. Thaaaaa muffin faiiiryyyyy, I loves it! I’m a big ol’ fan of muffins of all kinds and it’s been a long time since I’ve made the rhubarb varietal. That healthy streussel topping? Stop.it. Huge congrats on renovating the kitchen! Will you show us pictures, pretty please?! I LOVE poking around other people’s kitchens! P.S. I checked to be sure I’m following you on the correct Bloglovin feed, and I am, woop woop!! Yes, I will definitely do a post or two (or 17) on the kitchen, as soon as it gets rolling! I am hoping to have revised plans and, ahem, budget soon, so we can get this party started!! Oh Nora nora nora…times like this make me long to be your neighbor even more than usual. To be the recipient of cookie packages on my doorstep! Or these! Swoon. I am allll about the rhubarb-almond combo and all about your delicious creations! Actually, probably a good thing I’m not your neighbor or you’d probably have to stop ME from exploding on your muffins! Even MORE than usual!? Nicccccce! I wish you were my neighbor for so many reasons, but I would definitely make sure you wouldn’t explode. I got your back, don’t worry! Okay I saw this post on facebook and immediatly clicked on the link because well, muffins + coffee cake and you got my hooked. Seriously can I be one of your neighbors and get to sample all your baked goods?! I feel like all the healthy ingredients make it SO acceptable to eat these muffins like my life depends on them. PINNING. And if there is ever a recipe I will make of yours it will be this one!! Yeah that was my thought too! Anything + coffee cake is a winner in my book. You can definitely be one of my neighbors, any time!! I hope you get to try rhubarb!! Whatever you do, though, don’t try it raw. It’s unpleasant. Bake it into something!! Yummy! lol muffin fairy (: Not a bad nickname at all! Me too, Tara!! They are so fast and easy, so perfect for weekends. Enjoy!! Hi Lynn! Sorry about that. I recently switched to a new software to format the recipes and some of the information got damaged in the transfer! That’s supposed to be 6T (aka 1/4 C + 2 T) granulated stevia or monk fruit sweetener. The recipe is updated now so you could be able to reprint/refresh it and see the right information! Hi! I’m making these right now, but the sweetener is not updated on the recipe. It does not show how much goes in muffin and how much goes in topping. Can you please advise. Thanks! Hi Jamie – 6T goes into the muffin, 2T (or to taste) in the streusel. I hope you like them! How thick/runny should the batter be? More pancake batter or cookie dough? It should be sort of in the middle. Scoopable, but not so thick that you can roll it into balls. Do you know the nutrition facts for these? Thank you!! I just added the nutrition info to the post! My muffin batter is way too thick, I’ve added extra oil, about 1/3 a cup and it still was thick. Hope it bakes oK.